Success Secrets and Take Your Cat To The Vet Day. 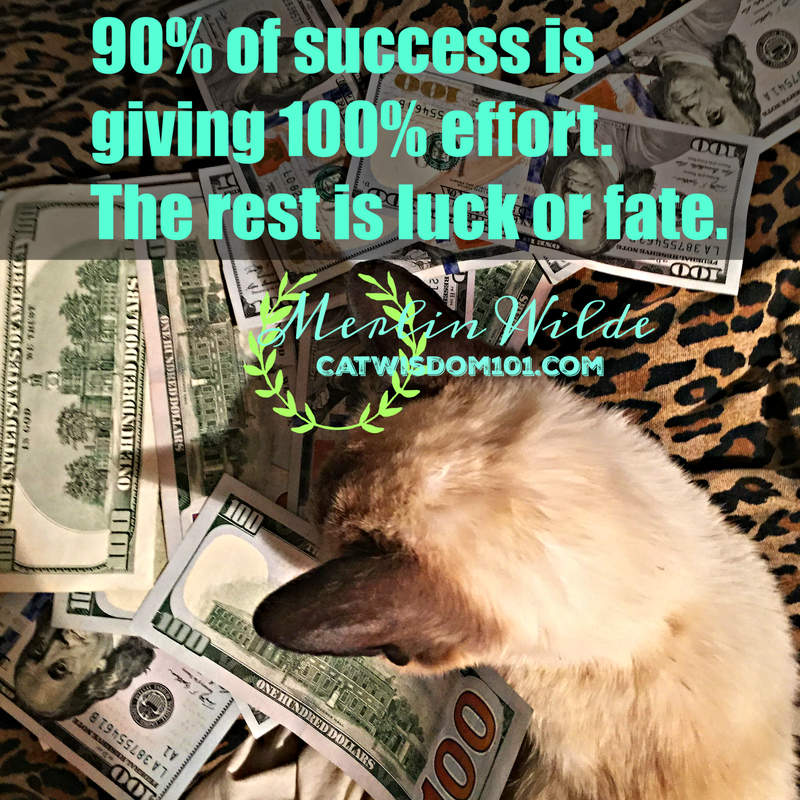 Hello, dearest ones, it’s your neighborhood wise cat, Merlin with thoughts on success and practical wisdom, like taking your cat to the vet. Why we need reminders and holidays, but we do. Check out the resources at CatVets. The American Association of Feline Practitioners. Truer words were ever spoken and it applies to everything. Every kind of success from being happy, healthy, wealthy or wise. I’ll bump up Woody’s 80% to 90% with a caveat. There is that tiny % of fate mystery, luck or whatever you want to call it that is the wild card. 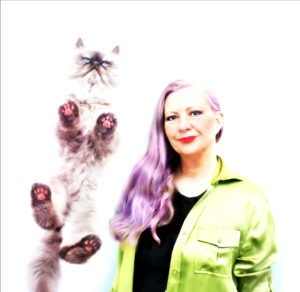 Who knew when I posed for this photo shoot with moolah, it would be one of my last. I can confirm: you can’t take it with you. But you can be smart and take your cat to the vet if you haven’t for a while. Make the effort. Your cat is worth it! This quote was also prompted by something my mom, Layla said about the value of just taking action, of showing up. As you may know, we’ve been planning our Black Cats Tell All book for months. Our deadline for story and photo submissions passed recently. There were so many stragglers we had to extend the deadline. A last minute and massive outpouring of interest ensued. Hundreds of photos, millions of messages, complete and incomplete submission forms to sift through, is the reason we haven’t blogged much lately. The dear cat people kept begging for extensions but, sorry the train has left the station. You need to show up. On time. She felt awful closing the door on some awesome cats, but there was no choice. And the thing is whether you want to apply for a job, write a book, follow your dreams or do anything of value, you have to just DO IT! 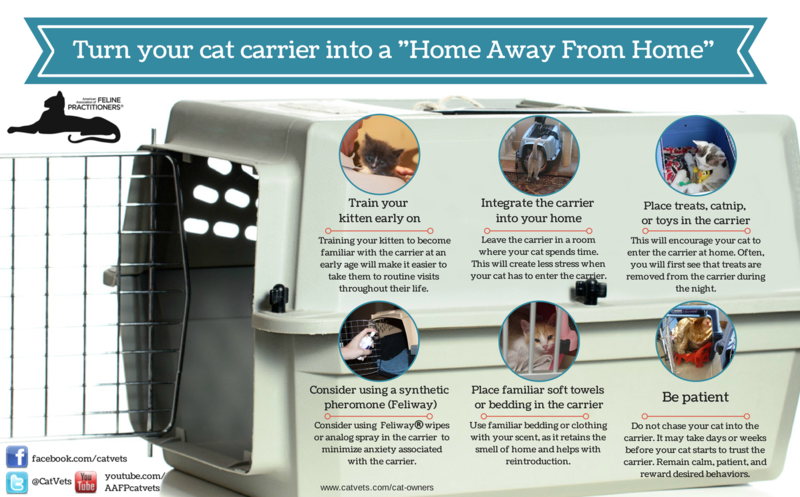 If your cat thinks a vet visit is no day at the spa and needs to be coaxed into a carrier, here are some tips. And remember, don’t actually take your cat to the vet today unless it’s an emergency. Just make an appointment! Thank you for your post i think it’s very necessary to get the cats check up on regular basis. I like the infographic it’ s very interesting I learned something new. Cats are great companion. They are quite good at hiding illness, more of the reasons no to postpone that check up date. A colourful and informative article. Great post. I totally agree with your point. Thank you for sharing useful information. Very wise advice here, I will definitely check the obesity issue, never thought of my cat being fat. I just fed them, cleaned them and ensured they are happy but now we are definitely watching the weight. It drives Mom Paula crazy when people always want extensions. Truffle went to the vet two weeks ago and Brulee is scheduled to go in September. that more cats don’t receive it. Great post. Success is hard work. A positive attitude always helps, too. you made some great points!! My favorite pertaining to what you said is “ya snooze, ya lose”….you know me, I have to say it in a much less tactful way BWWWWWAHHHHHHHHHHHHHHHH!!!!!! We, well mum, thinks Vet visits are important. We often go twice a year as mum buys a health plan that includes a check up( blood tests,etc) and up to 6 visits with no office fee.As 3 of us are over 10 years , that is important. Showing up is important, whether it’s at the vet or at a publication deadline. You have to do what’s healthy for you (and your book project) and put things in motion, after all. Great post, or posts should we say ! We agree for the showing up part, it applies to several areas, not only writing. Ahh the showing up part…. Punchy was in not top notch condition and was in no mood for pictures :/ Declining rapidly, but he is still enjoying the time in the garden hidden amongst the tomato plants. Eating wet cat food and moving only when needed. He is more friendly then normal I think he is saying his slow goodbyes, but cats are a mystery. Yep, vet care is essential, I have a couple who need dentals right now. My human agrees with the showing up part. She met with several writers at BlogPaws who had pitches – but have any of them sent her a proposal like she requested? Nope. Thank you Layla!!! We all need to be reminded about important things like Vet care etc. Maybe book # 2 is in the works and you don’t even know it yet (all of the late submissions MOL) We despise being late for anything!!!! Ha,and yes about a book two, if I survive book one!